Have you ever tried running without socks? Many runners wonder whether this is a good idea or not. Some believe that running with no socks gives you more control while others feel it only destroys shoes. If you are thinking about going without socks on your next run, there are some things you need to keep in mind. 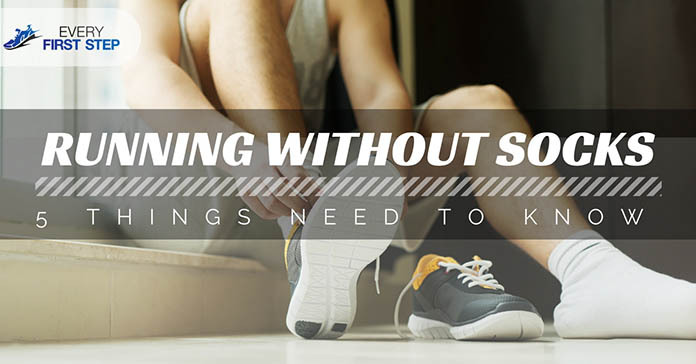 You may be considering running without socks because you want to reduce your laundry. Or perhaps you have heard of other athletes who do not wear socks and perform well. Another reason you may considering this option is because you are more comfortable barefooted. Whichever the case, before you decide to go barefoot in your sneakers, remember these disadvantages. The reason everyone wears socks with sneakers is mainly because of the ability for socks to capture moisture. Without socks as a barrier, all the sweat from your feet transfer to your sneakers and cause them to stink. Taking your shoes out in public may be very embarrassing. People who have tried going without socks say that no amount of deodorizer helps to get rid of the smell. Another disadvantage of wearing sneakers without socks is that you can get blisters. This especially happen when you wear new sneakers without socks. Running with your bare feet rubbing against the sneakers is sure to give you blisters. The amount of time it takes for the color on your shoes to fade will be greatly reduced if you run without socks. Socks not only keep moisture but also collect dirt from your feet so that your sneakers remain clean. Without socks, all the dirt from your feet will be left on your sneakers. Without socks to trap moisture, it is easy for your shoes to get moldy. In some cases, green spots may start to appear inside. Wearing sneakers without socks can also hasten the wear and tear of the cushioning in your shoes. Moisture easily gets trapped inside the shoes and with constant running, your cushioning may wear out. Although these conditions may not be the suffered by everyone, most who decide to go without socks can relate. Despite all these disadvantages, you may still want to try going without socks. If this is the case, here are s﻿﻿﻿﻿﻿ome tip﻿s to try and minimize the effects mentioned earlier. This may sound questionable but duct tape can help in preventing blisters from forming on your toes. Many athletes use duct tape on their toes to help prevent blisters especially on the undersides of their toes. Simply wrap your toes in duct tape leaving out the rest of your foot. Using petroleum on the parts of your feet that are in close contact with your sneakers may help prevent blisters. For example, you can put Vaseline on the front of your foot that is in contact with the tongue of your sneakers. Another place is the heel which usually rubs against the back of your shoe. If you choose to do this, make sure you tie the laces tight since Vaseline makes it easy for your shoes to be removed. This is another preventive measure which may help with combatting the smell. You may use any kind of talcum to try and keep your feet dry when you run. Depending on the duration your feet are in your sneakers, using talcum may be the solution for smelly feet. One of the reasons you may experience discomfort when wearing sneakers barefoot is because of the size. Try getting a shoe that is a size smaller to wear without socks. This may increase your comfort and reduce the chances of unnecessary running against your shoe. The decision not to wear socks when running is, of course, up to you. However, it would be wise if you consider the disadvantages as mentioned earlier before throwing your socks away. Also take some preventive measures to ensure you minimize the smell and wear and tear. Being comfortable while you run greatly affects your performance. Make sure you consider all factors before deciding on the matter. How did you like this article? Have you tried running without socks in the past? Do share your experience here; we'd love to hear them. Also, make sure to share this with other running enthusiasts.